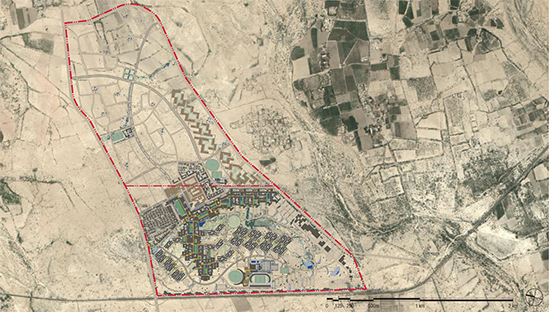 When Payette embarked on a master plan for the Aga Khan University Faculty of Arts and Sciences (AKU-FAS) in 2003, it was a unique opportunity to plan and design a new campus from scratch in the ex-urban desert outside Karachi, Pakistan. The scale of the project was daunting: 560 acres (by way of comparison, New York’s Central Park is 778 acres); about two million square feet in the first phase for 1,600 students; planned growth up to 12,000 students. The first thing we needed was an organizing principle. During the early months, as we worked through a series of initial studies for the plan, I became fascinated by a concept in Nader Ardalan’s book The Sense of Unity that he calls “harmonic order.” It is an idea of movement, of an urban morphology with multiple centers that form a linear progression of spaces. This idea resonated with me because it pointed toward a solution to the problem of the cluster as an organizational structure. The first Aga Khan University campus that Payette designed in the 1970s and 1980s was based on the cluster model, a cellular structure of interconnected buildings and courtyards, following historic precedents – fort and palace complexes – in Islamic architecture such as the Alhambra de Granada. But a cluster is somewhat finite: at a certain point, it becomes disorienting without a second-order system. 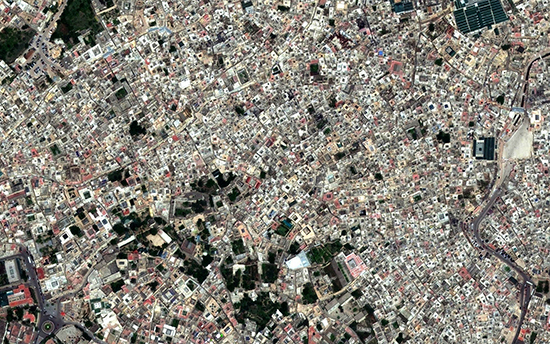 In many historic Islamic cities, such as old medina in Fez, Morocco, the “vascular” network of streets and branching, dead-end alleys serves to provide a navigable system that also denotes a spectrum from public to private. However, we were designing a campus, not a city. For AKU-FAS, we needed an organizational structure that would give students, faculty, and visitors a clear sense of place and set the various parts of the physical campus in specific relationships to one another. 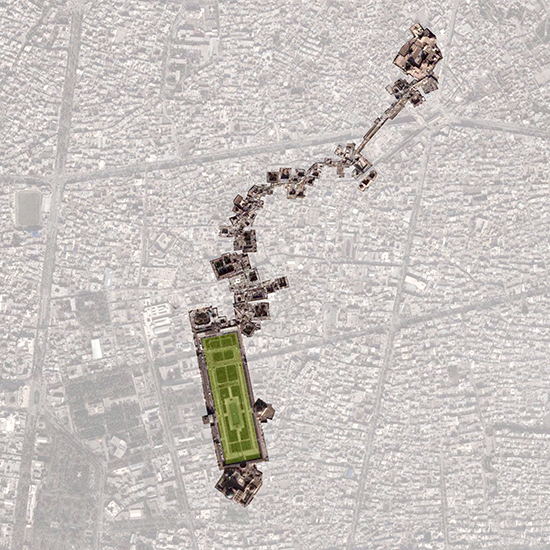 The sixteenth-century Maidan-i-Shah, in Isfahan, Iran, one of Ardalan’s primary examples of harmonic order, pointed toward a solution to the problem of the cluster. The Maidan is an expansive open space, measuring approximately 1,667 feet long by 525 feet wide, too large to be an effective campus space. What was instructive about the Maidan-i-Shah is how it condenses religious, civic, and commercial life in the city through architecture and urban design. Vaulted arcades line the edges of the Maidan, deferring to the grand portal of the Shah Mosque at the southern end and to the architecture of the Ali Qapu Palace and the Lotfollah Mosque along the long north-south edges. The ground floor of this arcade is used for commercial frontage, and at the northwest corner of the Maidan, the arcade ties into the old Imperial Bazaar, which snakes its way through the old city for at least a half mile, to the Maidan-i-Qadim and the Jameh Mosque. 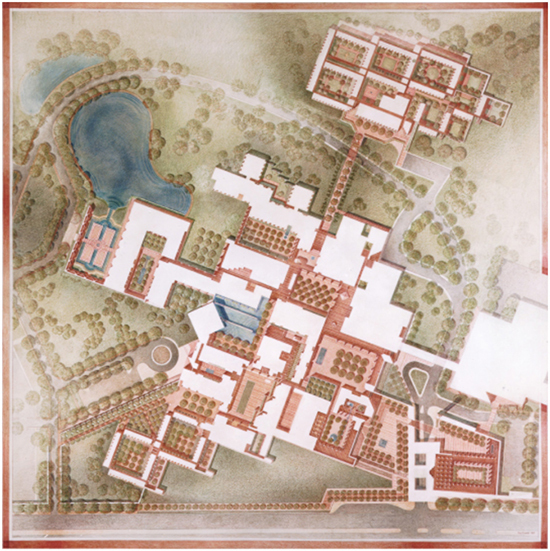 The AKU-FAS master plan synthesized these ideas and historical precedents by positing a staggered sequence of large courtyards (“the Spine”), intersected by a cross-grain of pedestrian streets (“the Fingers”) that cross the Spine at the edges of the major courtyards (“Maidans”) and connect various aspects of campus life, from student residences to the academic core to athletic facilities. The Spine and Fingers provide a framework for organizing networks of buildings and smaller courtyards in manageable clusters. Campus growth occurs by extending the Spine and by adding building-courtyard fabric along the Fingers. The Maidans, which comprise the Spine, serve as the primary campus open spaces. They are analogous to quadrangles in Western campuses, but they invert the familiar figure-ground relationship: in lieu of buildings sitting as objects in an open field, the courtyards-as-voids are the discernable figures, defined by the tight-knit fabric of buildings and arcades that surround them. Nader Ardalan and Laleh Bakhtiar, The Sense of Unity: The Sufi Tradition in Persian Architecture (Chicago: The University of Chicago Press, 1973). Stefano Bianca, Urban Form in the Arab World: Past and Present (London; New York: Thames and Hudson, 2000). Klaus Herdeg, Formal Structure in Islamic Architecture of Iran and Turkistan (New York: Rizzoli, 1990).